If a stock making a new high within the timeframe you monitor is sufficient input for you to enter a trade, any free charting platform will do. If the stock must meet certain parameters to be included within a watchlist from which entry candidates will be selected, there are several online brokerage platforms that can filter such lists for you. But if you’d like all of the above distilled down to the fattest pitches, served to you with the added benefit of machine pattern recognition, a statistical edge calculated over millions of daily backtested trades, as well as smart stop levels and sophisticated profit target levels, then you’ll enjoy the confidence of trading with Holly, the artificial intelligence engine built by Trade Ideas LLC. Each day after the close, Holly computes millions of backtested trades across 40 proprietary strategies. The results are analyzed, then optimized, then recalculated. We call this the “Quantitative Combine” and after applying some proprietary market direction inputs, only a handful of strategies will make the cut to feed us active signals on the next trading day. On an intraday basis, active traders will appreciate visual queues on locations Holly suggests would be smart places to place stops and profit targets based on current volatility, and past price action and volume. But more powerfully for breakout strategies, Trade Ideas recently rolled out a latest version of the software which plots past Holly entry points on daily charts so that you can see how stocks have performed since original trigger points. Some of the results are astounding. 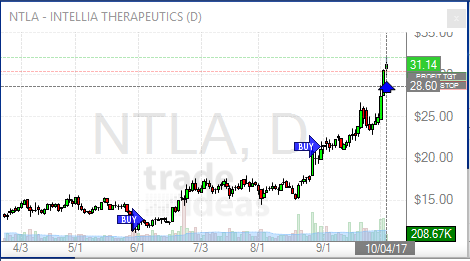 The above chart in $NTLA (Intellia Therapeutics) shows an entry triggered on June 5, 2017 at a price of $12.63. This alert popped up on the screens of Holly subscribers at 12:05 ET that day. A second chance to enter a swing trade occurred when Holly alerted subscribers to enter on August 31st at 10:38ET when the stock was trading at $21.36. As of the time of this writing the stock stock is trading at $31.14. 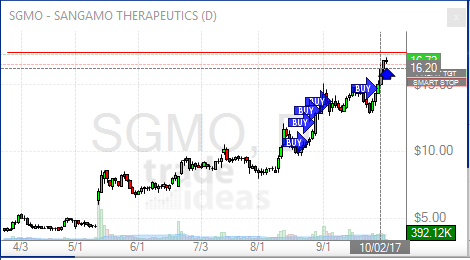 Swing traders who bought and held since the original signal are up over 146% in this trade in just 4 months. Not bad! 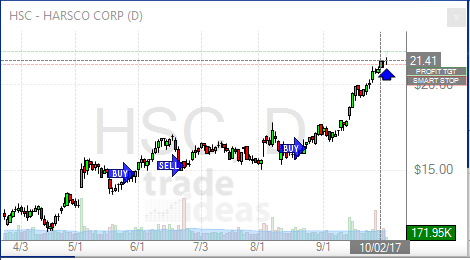 A more recent entry can be found in $HSC (Harsco Corp) where an August 24th entry at $16.25 would be yielding a 32% return on capital in just under 6 weeks. One thing that should be mentioned here is Holly is agnostic as to which stocks are triggered for trade entries. Holly doesn’t care if it’s a FANG stock or a member of the “race-to-a-trillion-dollar-market-cap” club. Nor does she have any preference to the names discussed on CNBC or chatted about in social media. Holly is your emotionless companion scanning thousands of stock tickers in real time, uncovering opportunities in places where the vast majority of the trading public is unwilling or unable to look. This alone is a tremendous edge for retail traders. Why compete in the biggest names against your most capitalized counterparts? Use Holly as your unfair competition against market participants not yet enlightened to the concept of Man + Machine. To learn more about trading with Holly, I highly recommend spending time in the completely free Trade Ideas Live Trading Chat Room with Barrie Einerson. He trades every day all day using signals derived from Holly, and he is incredibly engaging and helpful in answering questions. Here’s a special offer of 15% off if you want to jump in on any subscription plan. Head to this link and use promo code CHICAGOSEAN. Be sure to select a premium plan for access to Holly.